This week: This time, I think about the great potential of computer games to present and discuss morale issues. During the gameplay of a computer game, players frequently have to make choices in order to proceed with the game. Depending on the type of the game, those decisions can have a significant impact on the story and/or the player’s progression and, as a result of this, the game becomes more entertaining as choices do matter. The importance of choices is even enhanced by the fact that the virtual worlds are highly immersive and thus feel real to the players. Especially role-playing games (RPG) benefit from a system that allows the players to make important choices as it enhances the immersive feeling of being part of the virtual world. For example, during the gameplay of the Mass Effect  trilogy, players frequently have to make important decisions that will have an impact on the whole story. In one of the core missions of the first game, the player has to choose between one of two squad members as there is only enough time to save one of them. The decision made during this mission has an impact on the rest of the trilogy’s story as one of the both squad members will die and hence the story connected to this person will not be available for the player during this playthrough. The system of decision making can even be used to confront players with morale issues and to allow them to test their own morale values. During the gameplay of such a game, players can train morale decision making by analyzing morale and immorale effects of the potential actions. Furthermore, they will get a feedback about the outcomes of their decisions and thus can evaluate the morality of their actions. Aside from actively demanding a morale decision, computer games can also raise ethical questions by presenting controversial topics. 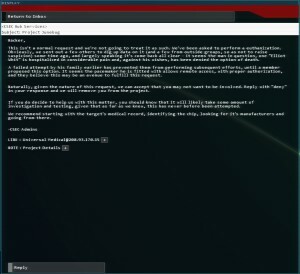 Recently, I have completed the computer game „Hacknet“  that puts the player into the role of a hacker who has to break into computer systems in order to complete missions and finally to learn about the fate of one of his friends. During the gameplay, the player has to accept a mission that requires the sabotage of a patient’s pacemaker, as the patient is hospitalized and has been denied the option of death although he asked for it. Due to the morale issues that are raised during the mission, the player can deny the request and is not required to complete the contract. However, accepting the mission is the only way to get the IP address of a server where an important hacking tool is stored and thus the player gets introduced to the topic of euthanasia even if he decides to abandone the contract after having downloaded the important software. The game itself does not continue to discuss the topic of euthanasia, but it will stick in the player’s head and make him think about the morale issues of active euthanasia. Additionally, the game also raises questions about the storage of medical data and the technological advancements of sensible instruments as the player has to hack a medical database in order to find the IP address of the patient’s pacemaker which has a constant access to the internet in order to be updated. Moreover, the player can start to think about his assignment and the way how he solves the request. 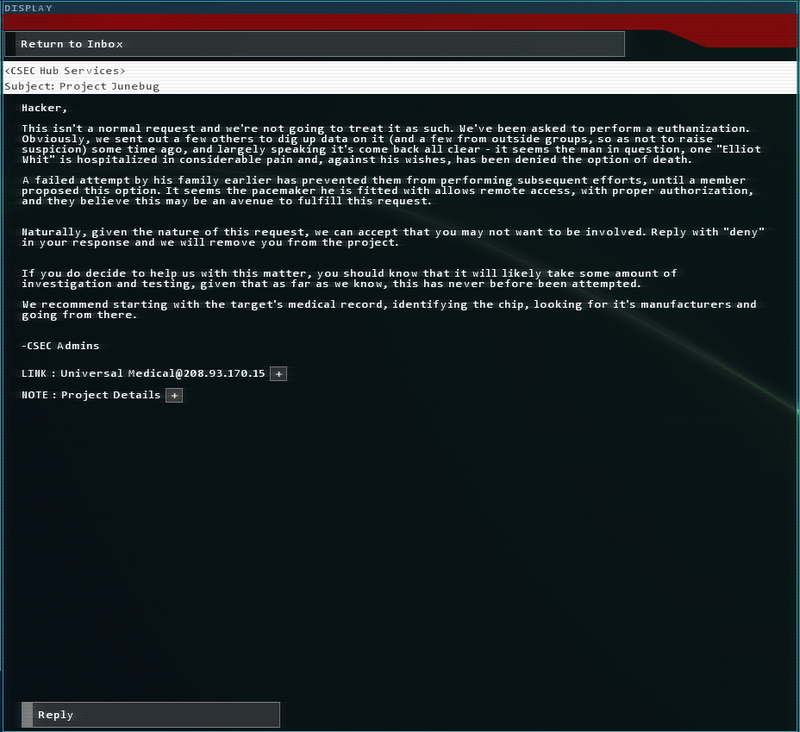 At first, the player receives an e-mail that contains all the important information, but he never meets someone in person. Furthermore, the player searches for the IP address in a medical database, but there is no guarantee that this entry is correct. Finally, the player sabotages the pacemaker via a short console command and remotely ends the life of someone else. In the end, the player has to test the own morale values and think about the own reasons for completing the contract. Computer games are an ideal environment for presenting and discussing morale issues as the immersion makes them feel real. Additionally, the player immediately receives feedback about the own actions and has to deal with results. In the end, computer games can help the players to morally analyze problems and to practice their morale decision making in a safe environment . This week: This time, I think about the rewarding effects of improving a design by trial and error in a computer game. In some computer games, players can design their own vehicles , factories  or cities . The design process itself mostly requires a lot of testing and redesign in order to achieve great outcomes. Although it can be quite frustrating to deal most of the time with issues of the own design, this part of the gameplay can be also really rewarding when the idea has become reality and is working without any flaws. For instance, creating a perfect infrastructure in Cities: Skylines that does not cause too much congestion can be quite difficult, but as soon as the player has solved all the issues and can observe the flowing traffic, he feels really rewarded and is proud of the own accomplishment. However, the design game mechanics do have a very important requirement: they need to be based on strict rules which can be learned by playing the game and more importantly by analyzing the own failures. Moreover, it is very important that the players are provided with tools in order to diminish certain failures once they have understood the underlying principles. For example, constructing a reliable aircraft in Kerbal Space Program (KSP) is one of the more complex challenges in the game. The main reason for the difficulty lies in the laws of nature that are simulated in the game. During the design process, players have to keep these laws of nature in mind in order to construct a functioning airplane. One of the main difficulties to construct an airplane is to find the right balance between the center of mass and the center of lift of the aircraft. Only if the aircraft is well balanced under all conditions, it will perform well during an actual flight. In order to achieve such a balance, the player is provided with tools that show the center of mass and the center of lift. Furthermore, the player is able to adjust the amount of fuel in the fuel tanks in order to simulate the change in the center of mass due to the fuel consumption during the flight. The indications for the center of mass and center of lift are enabled. New players have to develop an understanding for the principles and the balance between these two main factors before they can build capable vehicles. This learning process involves a lot of trial and error as they have to experience the effects of changing the airplane’s balance. After each test flight, they can evaluate the effects of the changes they have made to their designs and learn from their mistakes. Over time, they will develop a basic understanding of the underlying principles that will help them to finally construct their first stable aircraft. Furthermore, due to the fact that KSP is based on the laws of nature, players can even look up additional aerospace knowledge in order to improve their design skills. Personally, I find the game mechanic of constructing own vehicles very rewarding. It is interesting to observe how the initial idea for a vehicle gets improved over time due to the effects of the laws of nature. The most rewarding moment is when a certain vehicle finally performs as desired after a long development and testing period. This moment makes me realize what I have accomplished and how much I have improved my initial design. Recently, I was developing a new spaceplane that can take off from a runway, reach orbit and finally land back at the same runway without jettison any parts. The main challenge for me was to find the right amount of fuel and the right amount of engines to propel my spaceplane. The more fuel I added to the airplane, the more engines it needed. On the flipside, more engines require more fuel and so I was doing many test flights in order to find the right balance. Finally, as I achieved orbit for the very first time, I was really proud of my work and felt really rewarded. This week: This time, I think about the utilization of modifications in order to tell a unique story. A ‚Let’s Play‘ video (LP)  documents the progression of a player through a video game and adds an additional narration to the gameplay as the player comments on the own actions and the game’s story. Depending on the type of the game being played, the resulting video can have many forms. An LP of a story based game mostly documents the player’s progression through the game, whereas an LP of an open world game can also be used in order to tell a unique story. A story based game already features a story and does not allow the players to deviate from the story in order to experience something unique. In contrast to those games, open world games do not offer a pre-determined story, thus providing an empty canvas to the players . During their gameplay, players can explore those virtual worlds and experience a unique story no one else has experienced before. Using open world games for the purpose of creating an LP series is especially rewarding as each LP tells a different story and, as a result of this, differentiates LP series about the same game. Although each LP of an open world game tells a unique story, all the LPs do have one thing in common: they are based on the same game, hence the environment and characters mostly look the same. This minor flaw, however, can be deminished by utilizing some modifications  that allow a greater customization of the game world and, as a result of this, allow the creators to create a completely unique story. Additionally, some modifications allow the implementation of custom textures, thus giving the game world and the characters a new appearance. Vested content creators even can create personalized textures in order to emphasize their narrations. The emergence of open world games that allow the utilzation of modifications resulted in the phenomenon that one game can tell an endless amount of stories. Moreover, vested content creators can utilize these games as an empty canvas to create a unique narration. This week: This time, I think about the categorization of game modifications. Many computer games feature a modification support and thus can be modified in various ways by the players in order to enhance the game’s functionality, change the game’s audiovisual impression or to add new contents to it. Aside from the fact that this approach allows the players to personalize their gameplay and to experience a unique story, it also greatly increases the replayability of the game. In general, modifications can be classified in three different categories. The first category does not change the gameplay, but adds useful features that are not part of the original game. Additionally, this category includes modifications that changes the audiovisual impression of the game. On the one hand, these modifications usually help the players to play the game in a more efficient way by displaying additional information, such as statistics about the player’s status, performance and progression, or by adding additional camera modes that provide the players with a better overview. For instance, most of the World of Warcraft modifications allow the players to display additional information about their performance or to reallocate all the user interface elements in order to play the game in a more efficient way. On the other hand, these modifications also allow the players to personalize the visual appearance of the game by exchanging the textures and/or models that are used in the game. For example, Minecraft features a lot of texture packs and allows the players to create custom skins for their avatars. The second modification category changes and/or enhances the gameplay of the game by modifying the settings and/or the balance of it. Additionally, modifications of this category even add new elements to the game that allow the players to perform new interactions with the game world. For example, some of the Kerbal Space Program (KSP) modifications add new parts to the game that allow the players to perform completely new experiments or to build more enhanced vehicles. The KSP modification ‚Remote Tech‘ even adds the feature of radio communication to the game. Players who use this modification are required to establish a satellite network that relays radio communication signals in order to constantly control a robotic mission. The third modification category does not alter the gameplay of the original game. Instead, modifications belonging to this category utilze the core functionalities of the game in order to create a completely new game that has no connection to the original content. Players of these modifications experience a completely new gameplay and new game mechanics. Popular examples of this category are Counter Strike and Day Z.